During the Early Middle Ages; exact date unclear or disputed. Tradition gives 843 CE/AD by King Kenneth MacAlpin. a. Flower of Scotland, Scotland the Brave and Scots Wha Hae have been used in lieu of an official anthem. b. English is the official language of the United Kingdom. 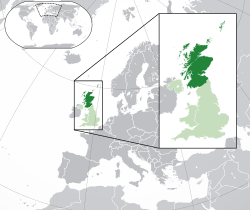 Both Scots and Scottish Gaelic are officially recognised as autochthonous languages under the European Charter for Regional or Minority Languages. Under the Gaelic Language (Scotland) Act 2005, the Bòrd na Gàidhlig is tasked with securing Gaelic as an official language of Scotland that commands "equal respect" with English. c. Historically, the use of "Scotch" as an adjective comparable to "Scottish" or "Scots" was commonplace, particularly outside Scotland. However, the modern use of the term describes only products of Scotland (usually food or drink-related). d. Scotland's head of state is the monarch of the United Kingdom, currently Queen Elizabeth II (since 1952). Scotland has limited self-government within the United Kingdom as well as representation in the UK Parliament. It is also a UK electoral region for the European Parliament. Certain executive and legislative powers have been devolved to, respectively, the Scottish Government and the Scottish Parliament at Holyrood in Edinburgh. e. Also .eu, as part of the European Union. ISO 3166-1 is GB, but .gb is unused. ↑ "Analysis of Ethnicity in the 2001 Census - Summary Report". The Scottish Government. 4 April 2006. Retrieved 11 October 2012. ↑ "St Andrew—Quick Facts". Scotland. org—The Official Online Gateway. Retrieved 2 December 2007. ↑ "St Andrew". Catholic Online. Retrieved 15 November 2011. ↑ "St Margaret of Scotland". Catholic Online. Retrieved 15 November 2011. "Patron saints". Catholic Online. Retrieved 15 November 2011. ↑ "St Columba". Catholic Online. Retrieved 15 November 2011. ↑ "Directgov: English language – Government, citizens and rights". Directgov. Retrieved 23 August 2011. ↑ "European Charter for Regional or Minority Languages". Scottish Government. Retrieved 23 October 2011. ↑ "The Countries of the UK". Office for National Statistics. Retrieved 24 June 2012.